Stephen Curry brought the Oracle Arena faithful to their feet in Game 2. 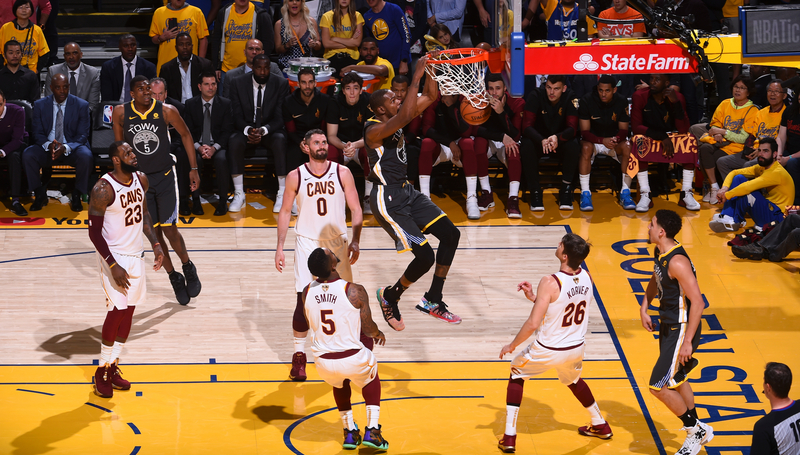 The Golden State Warriors reached top gear to soundly beat the Cleveland Cavaliers 122-103 in Game 2 of the NBA Finals. 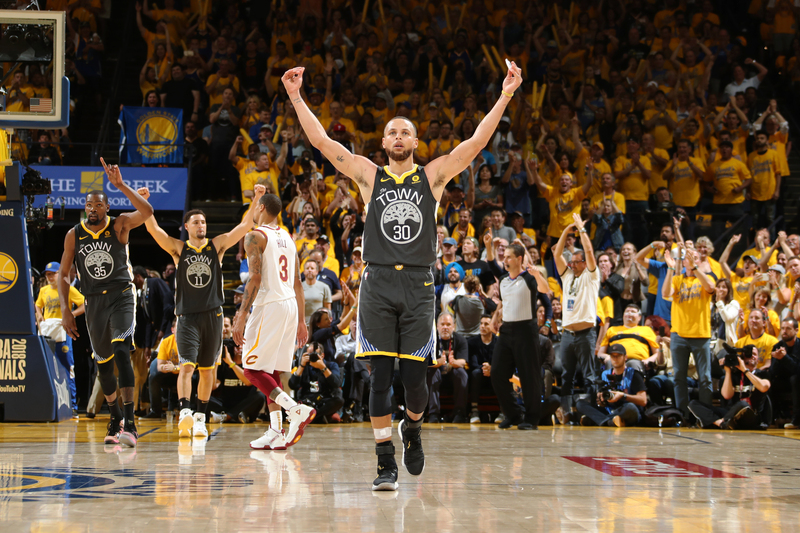 Stephen Curry hit a Finals record nine 3-pointers and had 16 of his 33 points in a scintillating fourth quarter to cap off a strong showing by the Warriors as a whole. LeBron James, meanwhile, didn’t come close to matching his 51 points from Game 1, but had another near triple-double. Here are player grades for both teams. LeBron James was relentless attacking on drives in Game 1. LeBron James may not be able to play any better than he did in the opener of the NBA Finals, but the rest of the Cleveland Cavaliers certainly can – and that should give them some optimism heading into Game 2. There was a sense after Cleveland fell in overtime of Game 1 despite James’ 51 points that the Cavaliers had wasted a masterpiece by their leader and that winning in the rest of the series will only become harder. 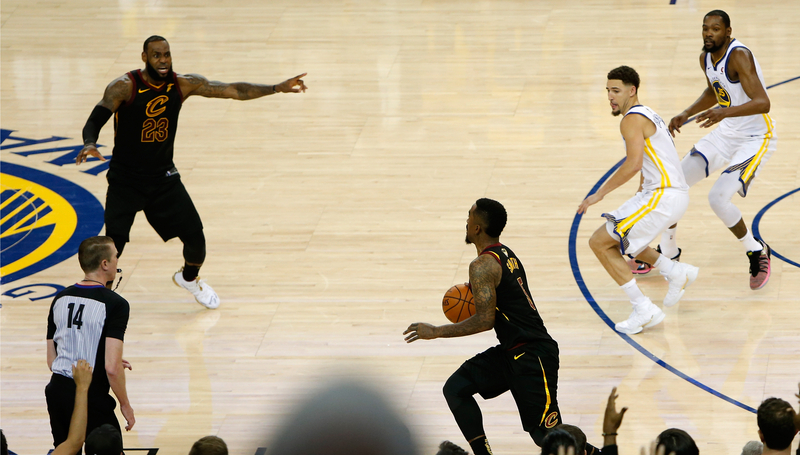 While they definitely let the Golden State Warriors wriggle out of their grasp – in large part due to George Hill’s missed free throw and J.R. Smith forgetting the score in the final seconds of regulation – Cleveland showed enough to suggest the series may not be as lopsided as originally thought. “Listen, we’re not broken. We lost a game,” Cavaliers coach Tyronn Lue said. “You got to win four in this series. We understand that and it was a tough game for us. We played well enough to win but we didn’t, so now we’ve got to move on. 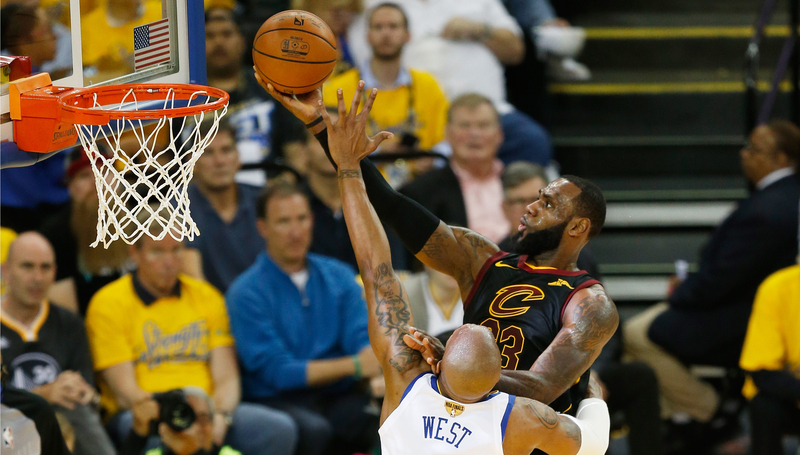 Though it was largely the work of James, the Cavaliers offence managed to keep up with Golden State’s prolific attack in spite of an off shooting night. Cleveland shot just 10-of-37 from long range, including 2-of-12 on open 3-pointers (closest defender is within 4-6 feet) and 6-of-20 on wide-open looks (closest defender is 6-plus feet away). It’s not like the Warriors also struggled to hit shots they normally make as they were 6-of-15 on both those types of looks. Throughout the playoffs – and all season – 3-point variance has been a barometer for the Cavaliers’ success. They’ve made 37.7 per cent from deep in their 12 playoff wins and 27.2 per cent in seven losses as their nights have often come down to one simple question: are they hitting shots or not? The shot opportunities will continue to be there as long as James is around and especially if he continues to attack like he did in Game 1, when he took a page out of the Houston Rockets’ playbook and heavily utilised isolations. According to Second Spectrum, James had 28 direction isolations and 30 direct drives in Game 1 – seven and nine more, respectively, than he’s had in any game over the last three seasons (including playoffs). James is going to be aggressive, that much is known. Golden State will have to choose between sending extra help defenders his way to slow down his scoring, which will open up shots for his team-mates, or to let him keep feasting. LeBron James has scored at least 40 points in all 3 of the Cavaliers' Game 2s this postseason. Though James may not have to play better than he did in Game 1 for Cleveland to win, Lue isn’t putting any limits on his superstar. As disappointing as the end of Game 1 was for the Cavaliers, they’re still in position to shift the balance of power by stealing one on the road before the series moves to Cleveland. One game in, they’ve already proven they can hang with the defending champions. Translating that to a win is the next step.